Layout Manager John Williams, Deputy Andy Mullard A small portable 'OO' gauge layout designed to show how D.C.C. sound can be achieved. 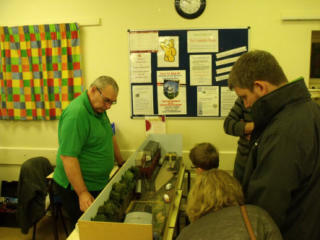 For several years in a row, as a club we attend the Warley Show with our club information stand. About 8 years ago we decided as a club that a small layout would be ideal to display the information stand and give us members a bit more something do and be more interesting to visitors. Kinlet Road was designed with ease of transport in mine. We want it to have DCC sound and with no point motors – points operate with wire in a tube. The layout is split in the middle and the one end of the layout becomes the top of a box for transportation. We use “The Gauge Master Prodigy DCC Controller”. 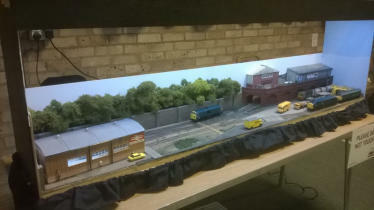 The first couple of years the layout attended Warley Show without any scenery, as we did not think it was a requirement at the time. However, we did eventually add scenery. All the buildings are scratch built, with some modified kits. 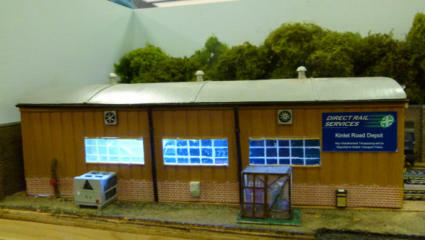 The layout depicts a very small depot in British Rail Blue days -We think these sound better than the modern ones.